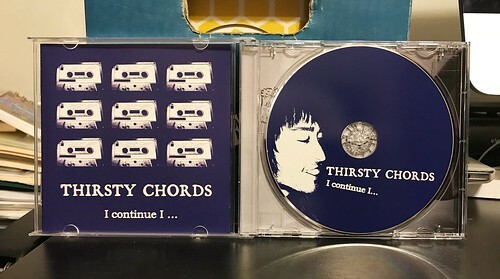 As soon as I heard about this new band comprised of Jordy (Creeps, Crusades), Eric (Feral Trash) and Steve (Steve Adamyk Band), there wouldn't be a way you could have stopped me from buying it. With a pedigree like that, you can easily set yourself up for disappointment by expecting too much. Luckily, Cheap Whine delivers and then some. You hear the term power pop thrown around a lot. Often times it ends up being used on bands who are snotty garage bands missing the pop or bands that are severely laking in the power category. Cheap Whine suffers none of this. They songs are all blistering with the sort of energy that I go crazy for, but they never sacrifice the hooks or the wonderful poppy choruses. In a lot of ways, they remind me of The Marked Men, but with cleaner vocals. Just pop on any one of the album's myriad of hits. Try out the full blown downstroke madness of "Fall" or "Kasumi." Or the slightly more melodic, but equally powerful "A Little Change" or "Best Times." The entire album is just a blast from start to finish. 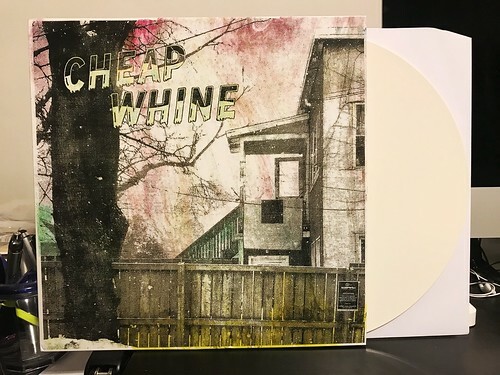 Cheap Whine doesn't really sound like and of the members other bands, but they have a close enough vibe and are drawing from similar influences that it would seem like madness to like Steve Adamyk Band but not Cheap Whine. Put simply; it's a hell of a record. In the never ending quest for punk points and the desire to know everything, even the craziest of us often fall short. I'm embarrassingly unfamiliar with Fifteen. 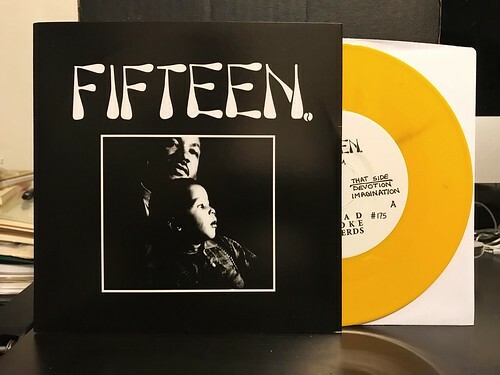 While I freely worship at the church of Crimpshrine, for one reason or another, I never picked up on Fifteen during those formative punk rock years when I was younger. I think in the 90's there were certainly less resources to buy everything I may have wanted to check out, either from lack of availability or (much more likely) limited funds to chase everything down with. So we come to 2017. Dead Broke Records has started to rerelease some Fifteen records, starting out with a 7" and an EP. I guess now is as good a time as any to jump in. I have to say, while I enjoy this 7", it's not the sort of mind blowing revelation as when I rediscovered Seaweed in my mid thirties. Not that the bands are occupying the same sort of sonic space or anything, but when I started listening to Seaweed I was so utterly knocked out with how fresh and powerful those records were. With Fifteen, I'm not quite as wowed. Frankly, all four songs on this 7" sound a little old and somewhat dated. There's definitely a sound from the late 80's and early 90's that sort of stayed there. That's not good or bad, it's just one of those things, sort of how it's impossible to not think Promise Ring records sound a hundred years old now (again, not that Promise Ring sounds anything like Fifteen either). Anyway, in comparison to Crimpshrine, Fifteen take a much more subdued approach to everything. In some ways, I feel that more emphasis is placed on the lyrics and this is certainly a band with something important to say. Musically things are a bit sparse and I never completely feel the sort of fury and energy that I'd get from Crimpshrine. And I get it, Fifteen is not Crimpshrine. Sometimes it's just hard to separate bands like this from each other. I like the songs on this 7", I guess I just don't love them. I've got an LP from Dead Broke that I'm going through as well. While I'm absolutely not giving up on going through more Fifteen releases, I guess I was just expecting something a little louder. Still, I'm glad that these records are more readily available to give a few other dinosaurs like me a chance to check out something we missed the first time around. While discussing Alligator Gun with some friends last night, I remarked that the one time I got to see them play, they were opening up for 30 Amp Fuse. I've had the second 30 Amp Fuse album, Saturday Night At The Atomic Speedway, since before it had even come out. I was sent a copy of it in advance when I was writing at my college newspaper in 1997. I was immediately taken with it and sure played the heck out of it back then. 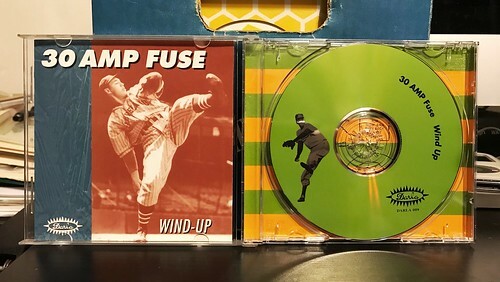 For whatever reason, I wasn't able to track down (or just didn't have the money for) the first 30 Amp Fuse record, Wind Up. As a friend pruned his collection a few months ago, I took that opportunity to add this to the collection. I've had the opening track on this album as a song on a 7" for decades. "Sorry" still holds up every bit as good today and it's probably the highlight of this album. However, this is an album full of some catchy, pop leaning punk rock songs. You can hear similarities to other crunchy guitar bands of the era like Pollen (especially with the gruff vocals) or Overwhelming Colorfast (with their mastery of a catchy hook). 30 Amp Fuse isn't afraid to put their foot on the gas and blast things off a bit faster like the sugar fueled "St. Patty's Day" which just races through with a nonstop blast of roaring guitar. A fun little tidbit is that John Davis (bass) and Don Coffey Jr. (drums), who would later become much more renown for their next band Superdrag, got their start on this 30 Amp Fuse record. But this is really the show of guitarist and singer Mike Smithers and it's a pretty good show. While poking around the internet a bit, I realized two things about 30 Amp Fuse. The first is that it doesn't look like I have Saturday Night At The Atomic Speedway on vinyl, so I'm going to need to correct that oversight. The second is that 30 Amp Fuse had a third album in 1998 that I never even knew existed. I'm going to have to take a look for that one as well. So if you haven't figured it out yet, I've bought a bunch of Soul Man 7"s over the last few weeks. There's more to come and I'm still not positive I have all of the different picture sleeves out there. And this is only Soul Man. 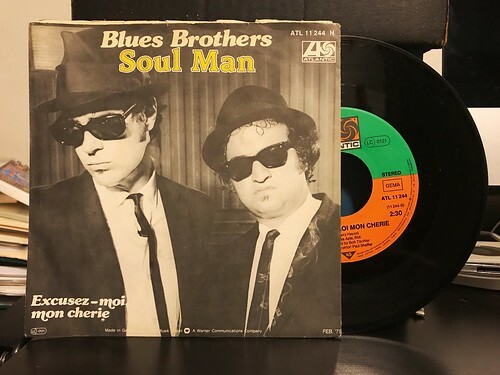 I can absolutely say, I've been very surprised to realize just how many picture sleeve Blues Brothers 7"s are actually out there. This particular one is from Spain. 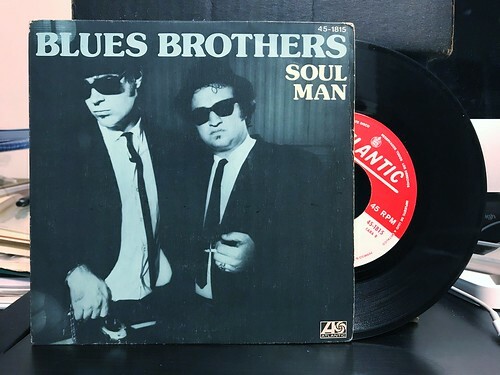 Like many of the Blues Brothers 7"s from 1978, they are once again reusing the Briefcase Full of Blues album artwork for the single. This time they've shifted the color scheme to a light green. It stands out, but I'm continuously baffled at how little artwork seemed to be available back then. That being said, I guess each individual country that released this probably didn't care if they were using the same art as a neighboring country. I dig the subtle differences between each one, but how great would it have been if every single had completely different art? Songs are the same as on the other versions: "Soul Man" and "Excusez Moi Mon Cherie." The collection continues to grow. I came across this band in the review section of Razorcake. The reviewer there had name dropped Superchunk as well as RVIVR and that seemed like an interesting enough combination that I went in search of this band from Spain. Once I found their Bandcamp page and gave this a listen, I was sold and immediately ordered. I can't say that I hear any Superchunk in this record at all, if anything this strikes me as a slightly poppier version of the kind of sounds that the Welfare Problems era Randy was putting out. It has the same sort of intensity and vocals that I think are pretty similar as well. 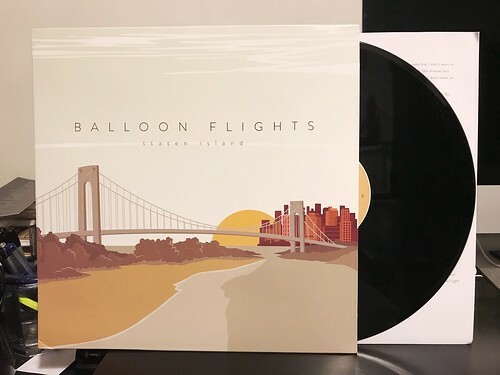 However where Randy was all about attitude, Balloon Flights embrace pop hooks to a much greater degree. Each verse builds to that big chorus were the songs all come to life. This seven song 12" EP is a great introduction to the band. The've got a few other EPs up on their Bandcamp page as well, but I definitely would be interested in a full length album from these guys. Hopefully they're working on one right now. 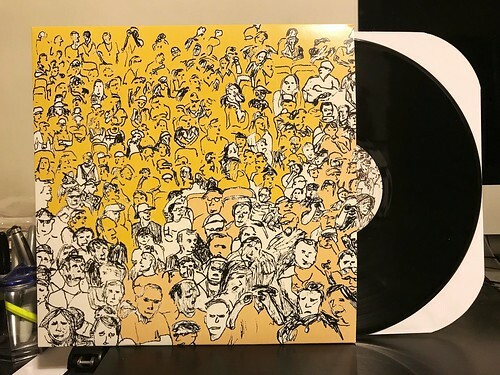 This Marvelous Mark album is comprised of some new songs as well as a bunch of tunes from prior EPs that have been added in to fill out the LP. 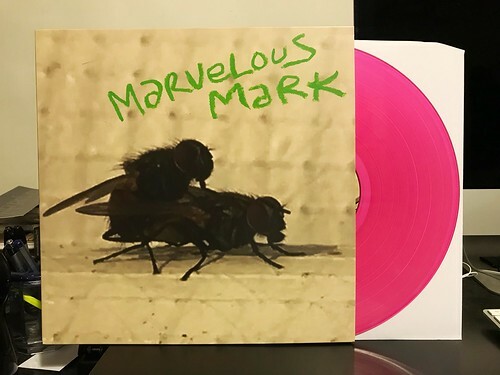 While I never quite seem to love Marvelous Mark songs quite as much as the songs he was cranking out in his prior band, Marvelous Darlings, there are some fantastic tunes on this album. While Marvelous Darlings traded in big pop choruses and a healthy amount of swagger, Marvelous Mark dives deeper into pure pop bringing together a sound that's part 90's guitar pop bands like The Posies, but combined with the sort of upbeat fuzz you'll find in modern bands like Wavves. Every one of the songs on Buzzin' is drenched in sugary melodies with hooks to match. I guess part of me doesn't love this album quite as much as I normally would since I've heard so many of the songs before, but if you only have Mark's last album Crushin', this is a pretty essential pick up. 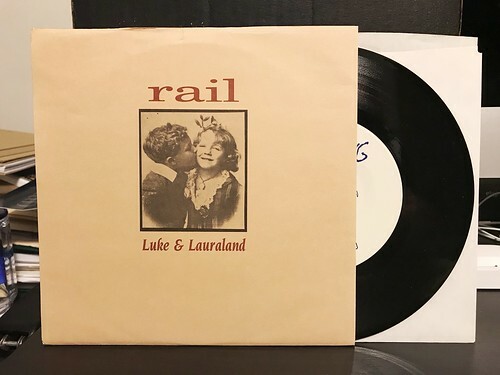 Even if you have the singles, the new songs exclusive to this release are still great, so I can't really imagine passing on this record no matter what your existing collection looks like. The singer from Plum sent me this CD. I had met him in Tokyp while he was playing with the new band he's in, 2 Sick Worry. 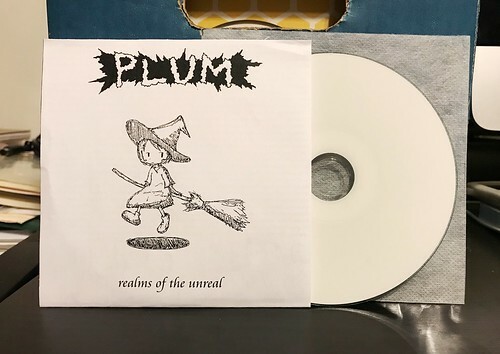 He gave me the Plum full length album at the show I saw 2 Sick Worry play and I reviewed that a few months ago. He followed that up by sending me this CD version of Realms of the Unreal that was only released in Chile. It has all four songs that are also on a cassette of the same name, but also includes a pile of extra tracks. We start out a little scary with "Sickage," a song that's essentially a lot of angry screaming, which as you may know by now, really isn't my thing. Luckily the album takes an immediate turn into the sort of high energy and catchy pop that I was hoping to hear. Because of the vocals, I tend to compare Plum to fellow Japanese band Navel a bit, but there's something about Plum that sets them part. I think it's a sweetness in the songs that just draws you in to the hooks and jangly guitar work. Aside from "Sickage," every song on this release is a bouncy pop gem. If you like fast, catchy, 90's style pop punk with high pitched vocals and tons of energy, it's definitely worth trying to track down. I know that I'm really happy to be able to have this CD in my collection. 2 Sick Worry is starting to work on getting some music out into the world and I'm really excited to hear more from them. I'll admit it, I absolutely was prejudging this record based on the cover. Even after all this time, I'm always a little weirded out by pictures of the band or artist on the cover of a record. There's no rationale to this, I own an uncountable number of great records that feature some version of a band picture on the cover. For whatever reason, that doesn't stop me from wrestling with some Larry David-esque rule I have in my head that bands shouldn't do that. 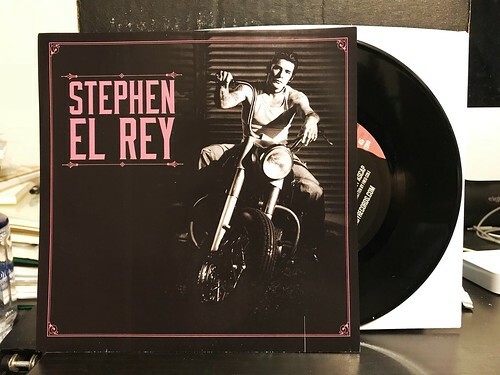 Anyway, I'm happy to report that my initial trepidations about Stephen El Rey were washed away once I actually listened to this 7". I'll say this much, it's a varied 7" showcasing a lot of different things over 3 songs. Opener "Poor Born" is a messy garage-y stomper, with reverb soaked vocals that jump in and out of the song like a pumped up Jon Spencer. While not my favorite song of the three, it's an energetic intro and I'm always in favor of that. When we move on to "Buried Under The Future," there's an immediate shift to a slower, surf tinged instrumental. A start comparison to the song before, but a nice break in the middle of the record. Things close out with "Drunk Again." This time, El Rey slows things down even more and enters that sort of low voice crooner territory that Dan Sartain once inhabited so perfectly. Now, the song does build into something bordering on a jumbled freak out at the end, but it manages to have a sort of charm that I find endearing. In my opinion, this is one of those 7"s where each song is better than the rest. I can't say I'm completely sold on Stephen El Rey, but I would certainly be curious to see what he's able to do over the course of a full album. I couldn't possibly explain why it took so long for me to finally buy this CD. I love Reverse. They had a string of 7"s that came out on Damaged Goods in the mid 90's that are among my favorite 7"s in my collection. Not quite as remembered as some of the other titans of the UK scene of the time, this Stoke-on-Trent band was one that I've always wanted to hear more from. I vividly remember trying to convince Dave, the trombone player from Snuff, to give me the Reverse shirt he had when Snuff toured America one time. He wouldn't part with it (though he did end up giving me a really excellent Letherface 'Mackem Bastards' shirt, so nothing but good feelings towards Dave). 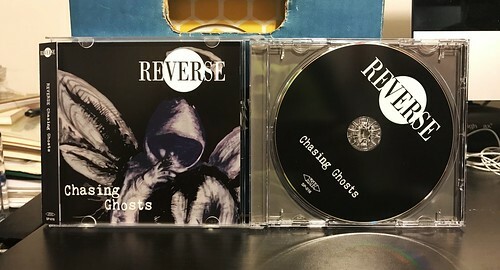 A little bit prior to this CD, SP records had released a CD of Reverse singles as well as some previously unheard songs they had amassed. The fact that they had another seventeen songs hanging around after that release kind of boggles my mind. Why didn't any of these come out back then? I will say this, while there are some truly fantastic songs on this record, they don't quite live up to my favorite songs from the 7"s. I'm sure that has a lot to do with the fact that I've been listening to the 7" ones for about twenty years while I haven't lived with the songs on this CD for anywhere near as long. Still, there's something about songs like "Denial," when the band is just tearing through their chorus with tons of vocal harmonies and energy to spare. Some of the slower songs on this CD don't grab me the same way, but Reverse still has a way of drawing me in with their gravely vocals and unabashed pop hooks. 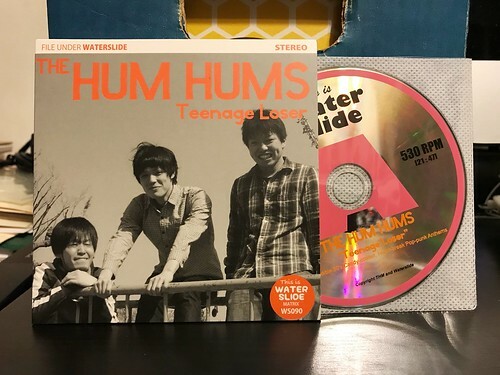 I can't really explain why they've been lost to history, but both this CD and the singles comp, Glance Sideways, are overlooked gems that deserve more attention than they get. 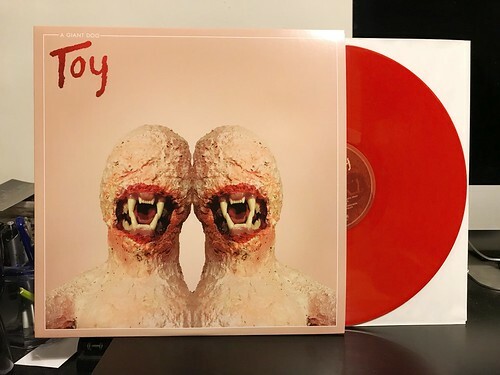 This isn't a review and this isn't a record that I've bought recently. 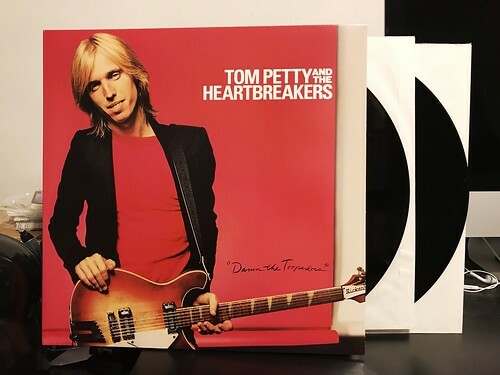 This is just a reminder that Damn The Torpedoes is a hell of a record and Tom Petty will be incredibly missed. Above is the 2xLP reissue from 2000. It's amazing. There are still many Tom Petty albums on my list of records to pick up, but this one will always be my favorite. I think I've said in the past, but 80's synth sounds turn me off of records faster than almost anything. So I'll brace you for that right now as the second that "Let The Death Toll Rise" started playing, they were fighting an uphill battle with me. 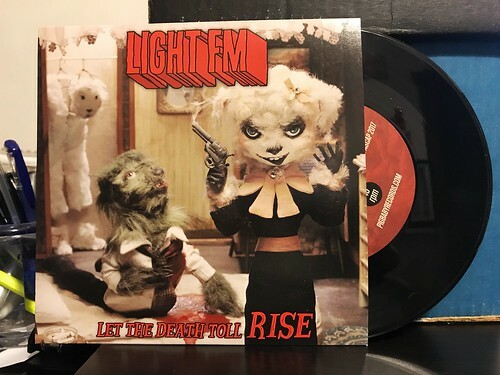 As the song progressed, my initial distain did subside a bit, but not to the point where Light FM would be a band that I would listen to very often. I suppose if you like this sort of thing, this 7" would be fine. Problem is, I don't like this sort of thing. To me, Light FM is aptly named as both songs are pretty slow and to me, a little boring. There's just nothing all that engaging about this band. They go through the motions, moving the song to its next logical chord change, but there's never anything surprising or something that makes you sit up and take notice. B side "Body Bag" isn't really that much different from the A side except that it's even slower and doesn't have any handclaps. As a rule, I can't stand 80's sounding pop music. It just turns me off so quickly it would make your head spin. When bands mine that time period for sounds now, it's just baffling to me. To each their own, but this one isn't for me.